Although it’s possible to shoot directly to a computer for stills, most still and video shoots will make use of media cards. This page outlines the various kinds of cards in use, and describes some card-handling procedures. When shooting on a DSLR, you will be recording to the camera’s memory card (or cards, if it has more than one). You’ll often feel as though you don’t have many choices when it comes to choosing your camera storage format. While some manufacturers support more than one format (offering both a CompactFlash and a Secure Digital card slot, for instance), the choice is still made by the camera manufacturer. Knowing what each format is capable of is important. All modern storage formats have their advantages and limitations. You can use this knowledge when shopping for a new camera body or when choosing which slot to use for cameras that offer both a CompactFlash (CF) and a Secure Digital (SD) option. The CompactFlash format is a mainstay for professional digital photographers. These cards tend to be the most robust and sturdy. The CF card format tends to be less prone to accidental damage. It was also originally significantly faster than early SD memory cards. When comparing costs per gigabyte, CF cards are typically more expensive than SD cards. CF cards tend to be offered with faster transfer speeds than SD cards. SD cards are most common in consumer electronic devices — in everything from music players and photo frames to GPS units. They are also becoming increasingly common in DSLR cameras. There are three basic types of SD card in three different form factors. Original SD - The original specification for SD cards tops out at a capacity of 2GB. Most of these cards are pretty slow. These are probably most useful at the moment for audio recording and use in point-and-shoot cameras. SDHC - The SD High Capacity specification allows cards to grow to 32GB in size, and also provided for a speed increase. SDHC cards may be incompatible with older devices. SDXC - Secure Digital Extended Capacity provides for storage up to 2TB. It uses an entirely different file system on the card which makes it less compatible with older devices than SDHC. SD form factors - Digital video cameras typically use full-size SD cards, but two other form factors are available. The miniSD and microSD sizes are used for mobile phones and other devices such as GPS recorders and some sound recorders. These small cards come in all three SD flavors outlined above. SD compatibility - To a much larger extent than CF cards, you may find that SD cards are incompatible with some cameras and other devices. When purchasing SD cards, it’s best to research what other users of your device have had success with. It’s also advisable to buy from a retailer that will allow the exchange or refund for a card that does not work with your camera. In early 2012, the Nikon D4 became the first DSLR to allow the use of a new generation of memory cards: XQD. These high-speed and high-capacity cards promise greater performance for still and video capture. The specification targets a transfer speed of 125MB/s and potential card sizes up to 2TB. Choosing a memory card for shooting stills or video can be a little confusing due to the creative language used by manufacturers to make their memory cards sound fast and reliable. It’s important to remember that stills and video have very different requirements in terms of speed. Generally, for stills you need a card that is capable of keeping up with the frame buffer of the camera. A fast card allows you to shoot at high burst mode (typically a range of 3–10 frames per second) for covering fast action. For still work, using slower cards means you’ll have to wait longer for an image to appear on the camera’s LCD. It also means slower import when you transfer images from a slow card to your computer. When shooting video, using a slow card can spell disaster. The reason is that video requires a sustained throughput to the card. The camera’s buffer is constantly being written to and then transferred to the card. If you try and use a slow card when recording video (which results in the card not being able to clear the camera’s buffer fast enough), at best you’ll drop frames and stutter. More likely, the recording will fail and you’ll lose the shot. Choosing a fast card is essential. But knowing what speed card to choose is not simple at first glance. CompactFlash is generally rated for speed using the notation 450X (or some other number). The X in this rating refers to a speed of 150 kilobytes per second. A 10X card can transfer 1.5 megabytes in a second, etc. For video you’ll want the fastest card you can afford. This means a card that is in the 133X-and-above range or faster. Try not to stay at the lower end of the spectrum as slower cards will take longer to download and transfer (with video workflows you’ll have much more data to process). Given the current market, the middleground in terms of price and performance are 300X cards. It’s most common to find SD cards rated at a particular Class. These refer to the data writing speeds. A Class 2 card can write 2MB/s, and a Class 10 can write 10MB/s. Some SDHC and SDXC cards use the newer Ultra High Speed technology. These cards can write at a minimum of 50MB/s. Note that to get the rated throughput, you the card and the device (camera, card reader or whatever) needs to be a UHS device, or the transfer will likely fall back to a slower speed. One of the best places on the Internet to find practical information about card speed is on Rob Galbraith’s website. Rob maintains a large database of cards and readers that includes lots of practical speed tests. Whenever your shoot takes up more than one card, you’ll need to have a plan for keeping shot cards separate from un-shot cards. You’ll also want to make sure that the un-shot cards are formatted and ready to go. Establish a numbering or coding system for your cards. If you find corrupted files, this will make it easier to track down which card may be creating the problem. It also just helps you keep track of your cards. 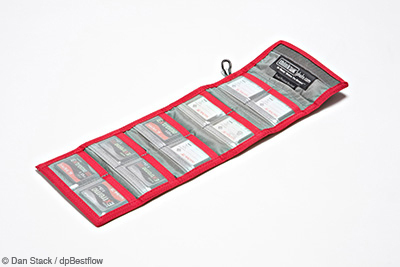 A useful way to keep track of shot and unshot cards is to use a card wallet. We turn the shot cards over, leaving the unshot cards with the manufacturer’s label facing up. This method coupled with a card numbering system helps us stay organized in the field. A cardholder also helps minimize any dust and dirt from touching the cards. ￼Figure 1 This ThinkTank card holder is a popular brand for photographers. Note that the top five cards have been turned upside down, indicating that they contain newly-shot images. 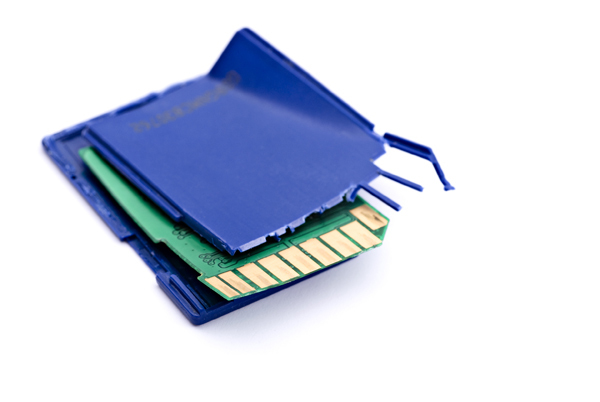 If you are storing SD cards in a wallet like this, you might want to consider using little plastic cases for added protection. 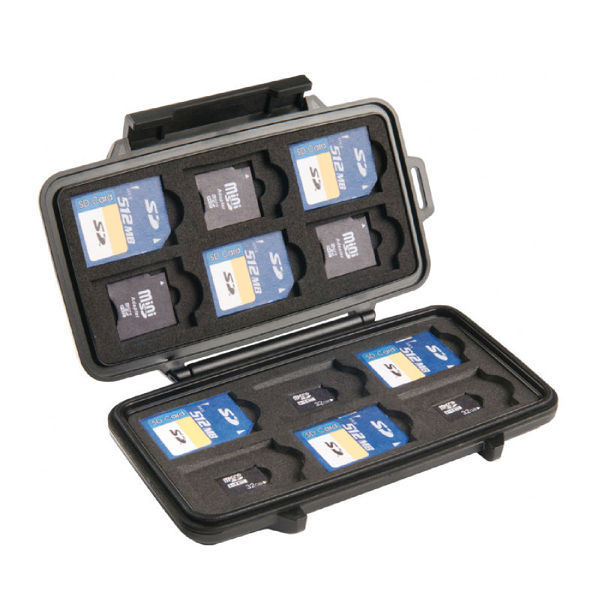 Figure 2 A Pelican Case card holder provides excellent protection and isolation to each card.